Sweet V back detail finishes off the look of sassy sophistication. Melissa Laskin an LA based stylist dates back 15 years in experience in styling celebs like Brad Pitt, Cate Blanchett, Kate Winslet, Penelope Cruz and many others. After years of experience she recently launched her own line of designer tees. Each design is so unique with hidden below the surface colors. A percentage of all her proceeds go to fund animal charities. As the name elvislaskin is inspired by her very own tabby cat Elvis! Tank available at Siren in purple. Elvislaskin vneck tee available at Siren in pink. 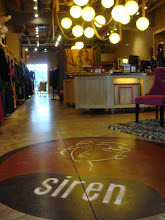 More styles available at Siren that are not pictured. along with many others...checkout below photos.